Home › Company review › BHP Company Review – Buy, Sell or Hold? BHP Company Review – Buy, Sell or Hold? Many retail investors with self managed super funds will be pondering as I have, what to do about the stocks in their portfolio after the recent market falls. The 15% correction is mostly due to weakness in the Chinese stock exchanges, and faltering of their economy. The fear has spread to other bourses. Like many other Australians I have had faith over many years in the big Australian miner, and am overweight in it. My investment has been profitable for me in the past, selling out fortuitously early 2011 in the mid-$40s area. I was then able to re-buy in the last year or two at an average price of $34 with the stock in a trading range between $31 and $35. There was a warning to sell a year ago when the share-price first sank under $31 but I chose to ignore it because BHP had announced a demerger with spin-off of some potentially very profitable mining activities into a new entity known as S32. Free cash flow, US$6.3 billion, down 26%. US$ 4 billion productivity was reached 2 years ahead of schedule. They will keep up a high capital allocation for exploration at US$ 8.5 billion in FY 16, and US$ 7 billion in FY 17. There is latent capacity to lower the cost of production for all products. The prospects are for 5% average annual volume growth. Production is growing 27% in last two years – iron ore, coal and US liquids with copper static. Emerging economies are likely to continue to grow increasing demand, particularly India. China’s crude steel production will peak at 935-985 Mt in the mid-2020s. Margins for lower cost iron ore likely to stay strong. Above is a weekly 5 year candlestick chart of BHP-Billiton. Most of the price action is in a trading range between $31 and $35. A year ago the share-price fell over a three-month period from $36 to $24, a 33% decline, before rebounding to resistance at $31 forming a double top. A second leg lower temporarily breached support at $23, and since it is now rallying, it may have formed a double bottom. It should be noted that the share-price is still technically in a down trend. For this reason retail investors would be wise not to invest further capital until there was corroborative evidence of a change in trend. There is not necessarily a right and a wrong way of managing the present price weakness. 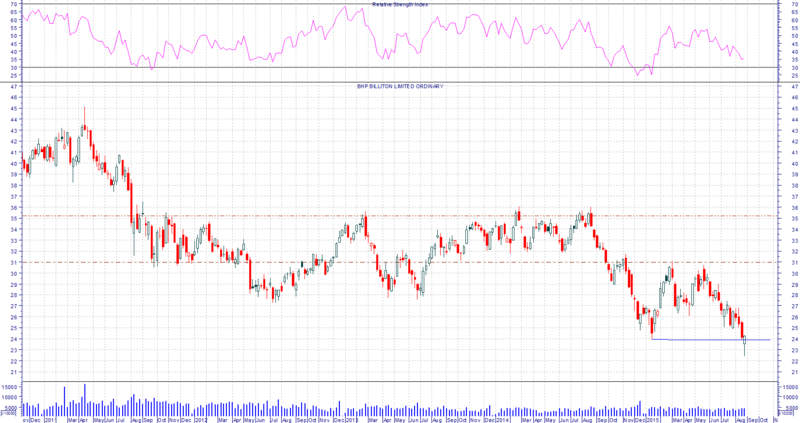 My intention is to watch the share-price carefully in the coming weeks with a stop-loss in mind at about $20. An impulsive move higher to break resistance at $27 might be a signal for me to add to my position if I was willing to increase my present over-weight position. ‹ What do you do when the market goes backwards?